Last year (2004), a musician named Lisa Kane who knows Beth asked me if I’d do a house concert for her. I knew who Beth was via the touring group she was a part of called Voices on the Verge but had not heard her music. I took a chance on someone I had not seen live before and turns out it was one of the best shows we’ve ever hosted. So good we went ahead and scheduled her right away again for June of 2005. 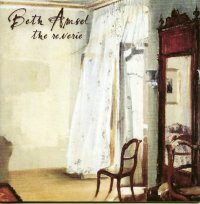 At that time I had “Kindling”, Beth’s second release of 2002 and I played it almost thin. It’s had so much use I am afraid the CD will shatter if I blow on it. So at the concert when Beth mentioned that upon her trip back home she would be starting to record a new CD I was thrilled. I’m happy to say that “The Reverie” is one of those perfect albums. Every single song is a winner. You don’t see those kinds of recordings very often. Tori Amos’ Little Earthquakes is one (the first one I ever felt this way about), Vienna Teng’s “Waking Hour” is another, and “The Reverie” is my newest favorite. Beth’s style however is not similar to either of those two artists. It could be described as alt.country plus folk. At times she reminds me of Dar Williams (especially on “Time”) and at other times I think more of your Gillian Welch, Kasey Chambers, etc types. But this recording has gone the extra mile and added some other genres as well. “Swing” is indeed a very swing-y song. Complete with full band sound. It takes me back to a time I never lived but kind of wish I had. She includes a couple of honest to goodness waltzes and even covers a Duran Duran song with “The Chauffeur”. Beth makes this song her own. Listening, it’s hard to believe these notes and lyrics were ever uttered by Simon LeBon. “Michigan” is very radio friendly and a fun sing along song. So is “End of July” the harmonies are gorgeous. “Come Up” is a sweet little song about getting’ in on. A note on the packaging: This is beautifully done. If you’ve read my other reviews you know that I believe packaging is an important part of the whole experience. This one is gorgeous. With the CD you get a booklet with lovely artwork, photos and the best part? The notes written by Beth regarding each song. She let’s us in on how and why the song was written, feeling surrounding it and, of course, the lyrics. Very nicely done. This is a great CD to crank up, lay on the floor and read the booklet as you listen. Then hit repeat, again and again and again.